There aren’t many reasons to seek out a film like Rio. It’s probably the very definition of inconsequential. But IÂ imagine that the filmmakers, who also gave us the three Ice Age movies, didn’t have much consequence in mind. A domesticated blue macaw is kidnapped and taken to Rio De Janeiro to mate with the only other bird of his kind. A weird hypothesis for the film to take, considering that we aren’t told what kind of blue macaw these birds are – hyacinth or throated? Is it a Spix blue macaw? And even so, why are there only two of them left? I’m not an ornithologist, but this crossed my mind more than once during the film. Suspending disbelief works most of the time. Early on in the film, and by “early on” I mean “pretty much during the opening credits”, we’re let in on the joke: this is a film about a bird finding the courage to fly. Of course, flying is a metaphor for being free. It’s not that the bird can’t fly, so he doesn’t have any sort of disability to overcome; it’s that he was knocked out of a tree by poachers when he was extremely young, and just never learned. 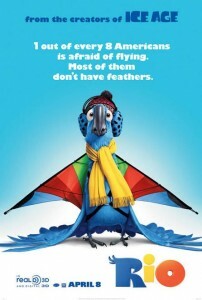 This bird is Blu (voiced by Jesse Eisenberg), and he grew up in the warm protective arms of a woman named Linda (voiced with love by Leslie Mann). Linda has no idea how special Blu is, and neither does he, until (for some reason) a Brazilian bird doctor walks past their bookstore and sees Blu for what he is – the last of his kind, sort of. The three of them go to Brazil, right before Carnival, to mate Blu with Jewel (voiced by Anne Hathaway) in orderÂ to continue the race. The birds are kidnapped for other gains, and the film finally truly starts, withÂ absolutely no urgency whatsoever. Rio winds up being a confusing film for something so simple. I’m not generally one for multiple subplots unless the film is a multi-narrative (imagine if Robert Altman had directed this). There are certainly colorful enough characters to carry the subplots, though. George Lopez is a family-man toucan, Tracy Morgan is a bulldog with constant brain lapses, and Jemaine Clement is Nigel,Â the bird chasing Blu and Jewel. Will.I.Am and Jamie Foxx provide some music and fun as Pedro and Nico,Â two of the toucan’s friends, particularly inÂ a beautiful song called “Fly Love”. Clement brings the majority of his Flight of the Conchords suave to the film in his songs. One thing that bothered me while watching this was the similarity to not just the Ice Age series, but alsoÂ the Madagascar films. If you can watch the squad of monkeys in this film and not recall either the penguins or lemurs from either Madagascar movie, then you’re better at shutting off your brain and enjoying a film than I am. Another small thing that bothered me was the depiction of Rio De JaneiroÂ as one big party in the middle of a slum filled with crime – that can’t be everything – and, of course, a jungle. But that’s a pretty two-dimensional outlook, no? I might be wrong, but I think there’s more to the city than that. All of the above taken to heart, of course, this is a kid’s film, and if we’re judging the film based on its own merits, then, well, it soars, to put it heavily. It definitely succeeds in having bright colors, big music, and fun action. It tells a familiar story, and that’ll most likely put off the adults who get dragged to it (especially considering how few jokes there are that little kids won’t get), but it tells the story with conviction. Rio doesn’t ask that you believe everything that’s going on; I find it hard to tell if the film cares or not. It just wants to dance and have fun.